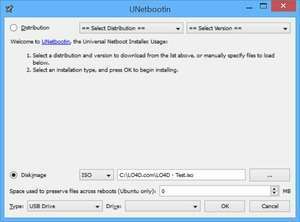 UNetbootin is a utility allowing you to create a live, bootable Linux Distro such as Ubuntu, Redhat, Fedora, Debian, etc without having to waste a CD. It can turn a USB drive with sufficient space. The program can run on Windows XP/Vista, Windows 7, Linux and Mac OS X. It loads distros from ISO images you've downloaded from a particular site and those that you've created yourself. Version 6.61 is a freeware program which does not have restrictions and it's free so it doesn't cost anything. For security reasons, you should also check out the UNetbootin download at LO4D.com which includes virus and malware tests. Additional screenshots of this application download may be available, too. UNetbootin has a presence on social networks.